Our latest style of exterior shutter combines the traditional loo k of a Board and Batten shutter with a frame and panel, providing a fresh approach to exterior shutters. The clean, well defined vertical lines will compliment your house and windows, while breaking the monotonous horizontal lines that you get on a traditional brick or siding house. Definitely something to consider if you don’t like the robust look of a Board and Batten shutter, but were put off by the sometimes “flat” look of a Raised Panel. 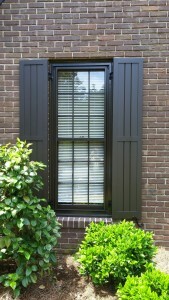 The Mission Panel style provides a very elegant look, breaking away from traditional shutter designs. Depending on your windows, it comes in one, two or three panel design, and obviously we are still using our proven composite wood material that will not rot, swell, pull apart or get attached by those pesky insects. Contact us today to make an appointment. 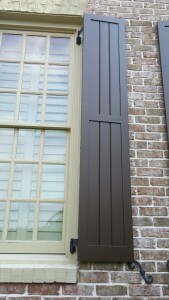 We’ll bring a sample to put next to your window to make it easier to envision how it will look on your house.